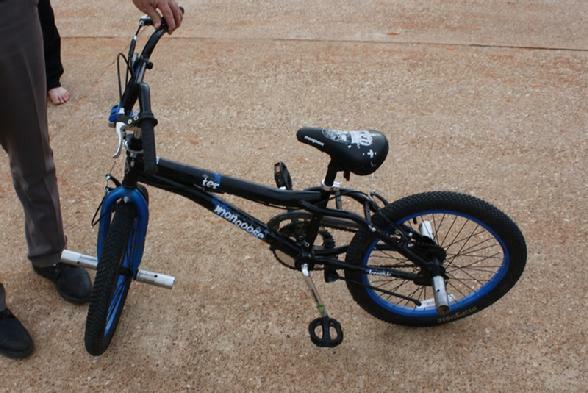 A 12 year old Livingston boy riding this bicycle was struck by a car on 190 West. 12 Year Old on Bicycle Struck by Car, SPRING CREEK, January 15, 2012 - At approximately 3:30 pm on January 15, 2012, a twelve year old on a bicycle was crossing over US-190 West from Magnolia Street to Gray Drive when he was struck by a silver 2005 Nissan Sentra driven by Brittney Taylor, 20, of Huffman. Taylor tried to avoid the inevitable collision. 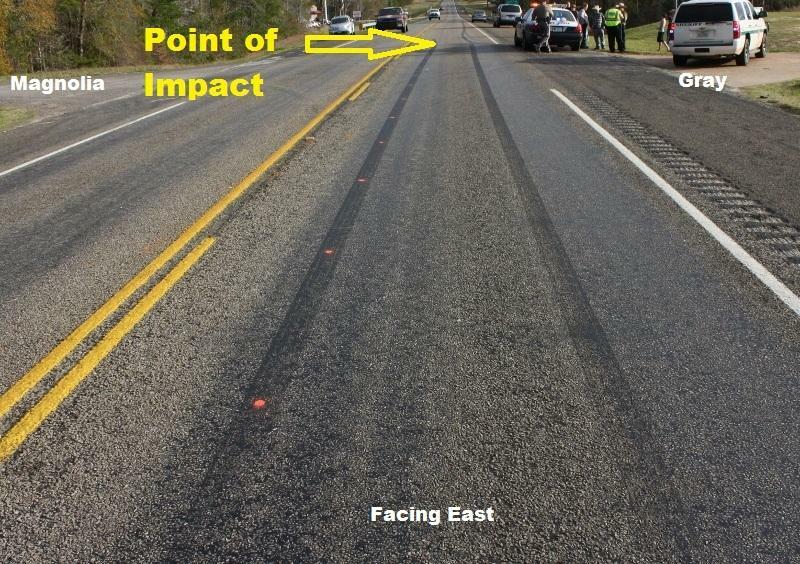 Skid marks around 60 feet shows where she slammed on her brakes long before impact. According to one witness, the collision knocked the young boy around 20 feet through the air where he landed on the south side of the pavement in the grass (the bicycle landed a short distance away from the child). Americare Ambulance Service was dispatched to the scene along with Sergeant Rob Thomas of the Polk County Sheriff's Office and Deputy David Ramsey and Trooper Kevin Burman with the Texas Highway Patrol. 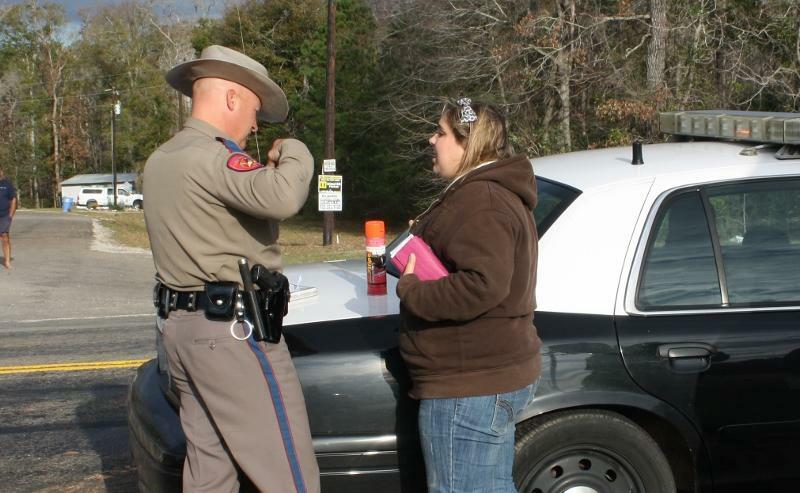 Brittney Taylor was visibly shaken up from the collision and crying on and off. The child was loaded onto an ambulance and driven to Livingston Memorial Hospital where he was loaded onto a helicopter and flown to Hermann Hospital in Houston with serious injuries. According to a family member, the child was in critical but stable condition (at time of press). 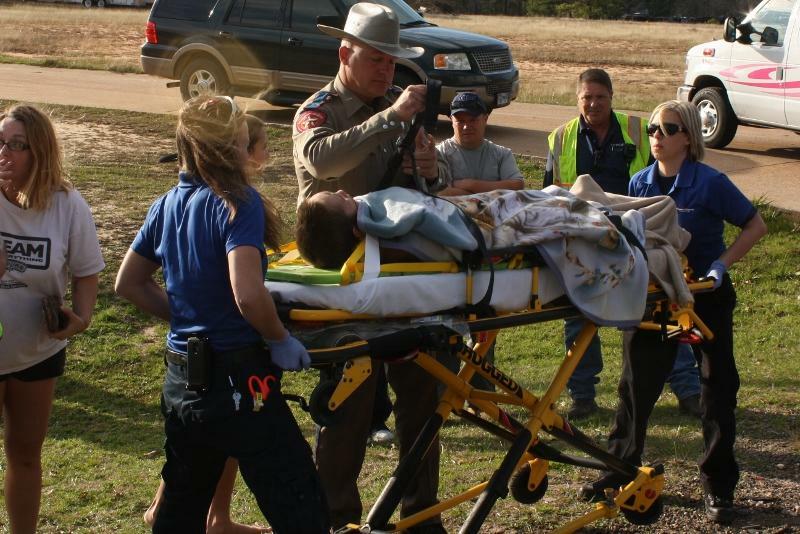 Trooper Kevin Burman assists EMS personnel with the young accident victim. Skid marks on the pavement of 190 West show where 20 year old Brittney Taylor tried to avoid the collision. Trooper Kevin Burman listens to Taylor's account of what happened. 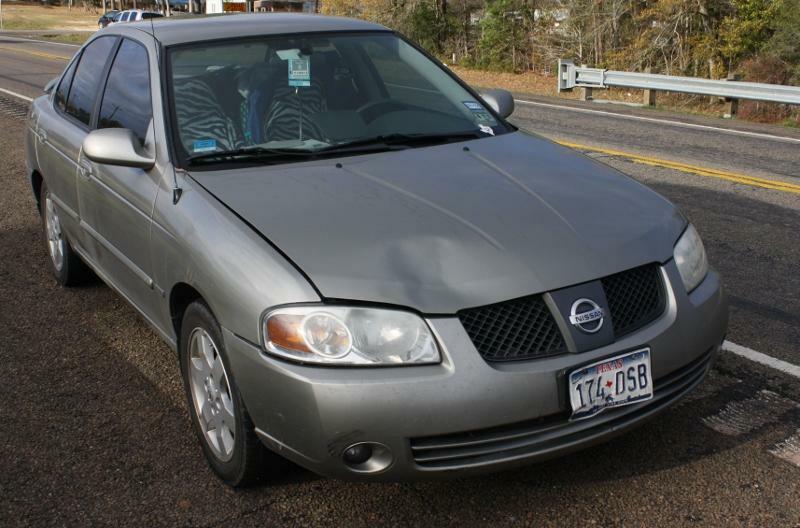 A dent on the front of the 2005 Nissan Sentra shows where the car struck the child.